Since Xara 3D was designed primarily for text animation, it can be a challenge and at the same time great fun to create more unusual 3D images within the X3D limitations. Using Xara X applications (ie. Xtreme and Webster etc.) to form the flat 2D vector shapes, one can then extrude these in X3D to model some effective images. This tutorial will hopefully describe the process of making a complex 3 dimensional image within X3D. 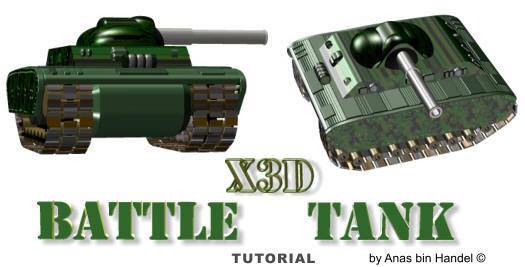 I first made this battle tank in Xara 3D version 6, as a challenge to both myself and the software.